In a previous blog (Evaluating Country Risk) we examined Bloomberg’s module for country debt ratings (CSDR). 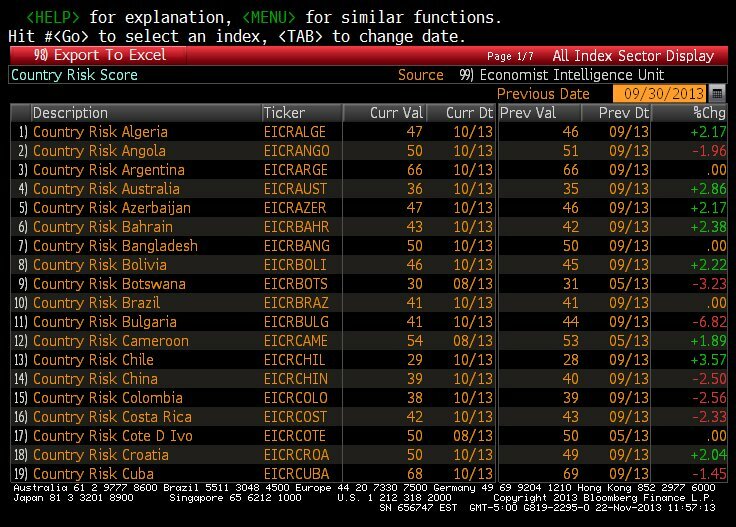 Here are some additional Bloomberg modules dealing with country risk. From the menu screen, click on OPEN to transfer the template to EXCEL. Then click on ENABLE CONTENT to activate the spreadsheet. Here is part of the country view for Canada. Risk scores range from 0-100. The higher the score, the less risk a country poses. There are several additional views of the data available. Model Summary: Gives a rank listing of countries by overall score, and subranking by Financial, Economic, and Political risk. Model Settings: This section allows you to change the default weights of the individual factors that determine the risk score. 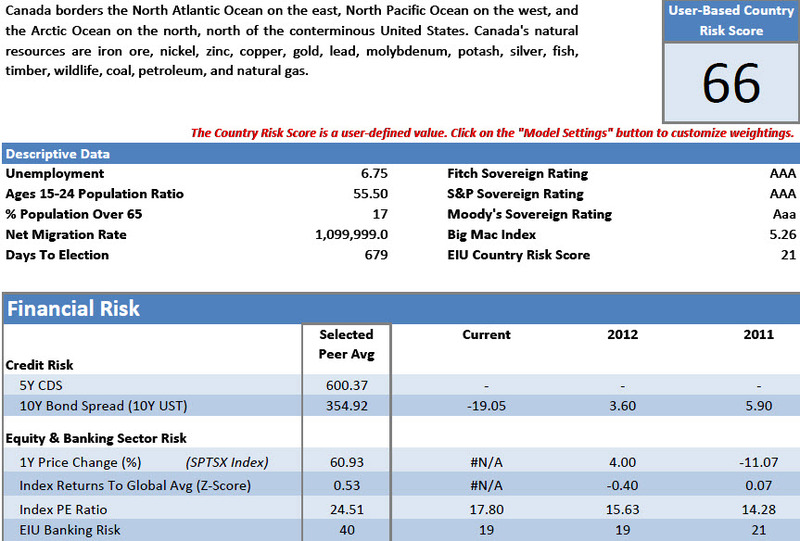 This allows you to “build your own” country risk scores. Individual sub scores for currency (ALLX EICU), banking (ALLX EIBA), and sovereign risk (ALLX EISO) can be accessed as well. Country Risk Premium: Bloomberg calculates the country risk premium as the return on a country’s stock market minus the risk free rate (typically government bonds) for the country. A recent figure for the United States is 7.09% where the risk free rate is 2.78% (ten year U.S. bonds) and the market rate is 9.88% (return on the S&P 500). For access type CRP<GO>. Here are the first few entries (for about 40 countries) ranked by country risk premium in descending order. For additional resources take a look at our Business FAQ, “Where do I find info on country risk — political risk, sovereign debt ratings, etc.?”. This entry was posted in Bloomberg and tagged Bloomberg, country risk, Country Risk Assessment, Country Risk Premium, country score, Economist Intelligence Unit by Michael Halperin. Bookmark the permalink.